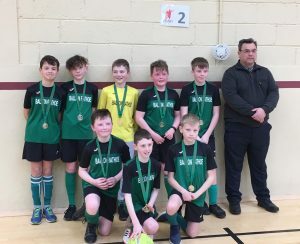 It was an early start for the Bennekerry/Tinryland and Ballon/Rathoe U13 boys indoor soccer teams as their final, held over from two weeks ago, was scheduled for 9am on Sunday morning in Ballon Hall. B/T got the first goal and this helped settle their supporters’ nerves. Their relief was short lived however as Ballon/Rathoe took control and shook the B/T net three times in the first half. This refined Ballon/Rathoe team, coached to perfection by John Whelan, came out strongly again in the second half and scored a further two goals. B/T only managed one more consolation goal before the final whistle left them disappointed with the 5-2 final score. Ballon/Rathoe now go forward to represent Carlow in the Leinster quarter-finals at a date to be confirmed in April. Ballon/Rathoe’s team was Rory McCaffrey, Callum Crawford, Martin Carroll, David McHugh, Eoin Doyle, Aaron Dowling, James Bergin and Edward O’Byrne. Manager John Whelan. Silver medallists were Joe Bermingham, Sam McHugh, Aidan Ryan, Oran O’Boyle, Lorcan Kelly, Conor Buggy and Eoin Ryan. They are pictured with B/T coach John McHugh and Charlie McHugh.